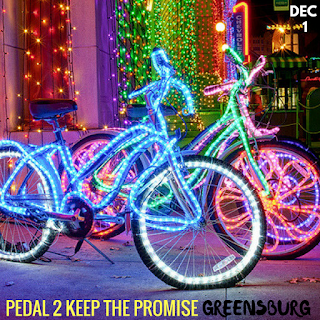 SU Ag Center to host Pedal 2 Keep the Promise in Greensburg, La. Baton Rouge, LA – The SU Ag Center will host ‘PEDAL 2 KEEP THE PROMISE!’ a National Campaign to promote keeping the promise to having a healthy body, mind & spirit! The ride will be held on Thursday, December 1, 2016, beginning at 5 p.m. behind the St. Helena College & Career Academy and continuing through the Town of Greensburg! Participants can ride their own bike or rent a lighted bike for $15. For more information, contact Nicolette Gordon at 225-222-4910. 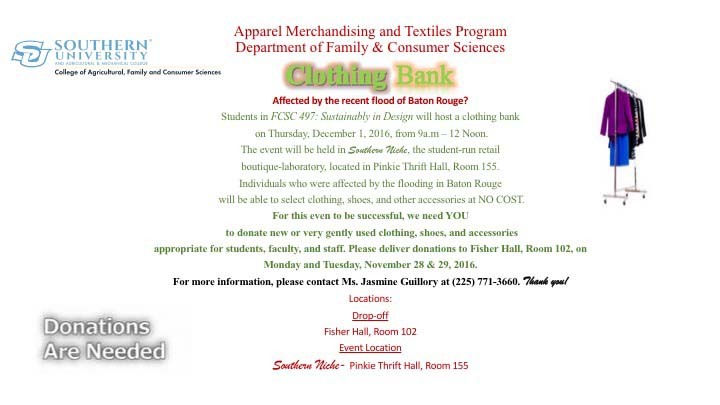 Baton Rouge, La - Students in FCSC 497, Sustainably in Design, Apparel Merchandising and Textiles in the Department of Family & Consumer Sciences, College of Agricultural, Family and Consumer Sciences will host a clothing bank for individuals affected by the recent flood in Baton Rouge. For this event to be successful, we need YOU to donate new or very gently used clothing, shoes, and accessories appropriate for students, faculty, and staff. Please deliver contributions to Room 102 in Fisher Hall on Monday and Tuesday, November 28 & 29, 2016. The clothing bank event will take place on Thursday, December 1, 2016, from 9:00 a.m.-12 Noon in the student-run retail boutique-laboratory, Southern Niche-Pinkie Thrift Hall, Room 155. Individuals who were affected by the flooding will be able to select clothing, shoes, and other accessories at NO COST. For more information, please contact Ms. Jasmine Guillory at (225) 771-3660. Thank you! Baton Rouge, LA – Foodborne illnesses caused by over 30 major pathogens are estimated to affect approximately 9 million people in the United States every year. Educating the public about following proper food safety practices are crucial. Food safety is a critical necessity for any dining and serving food experiences. For this reason, the Southern University Ag Center will held a free ServSafe certification program for individuals who are currently in the food service industry or those interested in opening a food business in the future. The certification program will be held on Friday, Dec. 2, 2016 from 8 a.m. – 5 p.m. in room 138 of A. O. Williams Hall – SU Ag Center Building, 181 B. A. Little Drive, Baton Rouge, LA. ServSafe is a food and beverage safety training and certificate program administered by the National Restaurant Association. The program is accredited by the American National Standards Institute (ANSI) and the Conference for Food Protection. The SU Ag Center offers the food safety (ServSafe) certification program to the public free of charge. To attend the class, participants must purchase the ServSafe Manager Book 6th edition, English (ESX6R) and the exam answer sheets, English only (SSEAS). The book and answer sheets can be purchased at the Barnes and Nobel’s located at 2 Union Square, Baton Rouge, LA 70803 (on the LSU campus) or online at www.servsafe.com for $70.30 and $38.00, respectively, plus shipping and handling. For more information or to register for upcoming classes, contact Fatemeh Malekian at 225-771-0251. Shy'Janae' giving her speech for president during the OMG Club election on Nov. 7. Photo by Nicolette Gordon, SU Ag Center Assistant Area Agent. Baton Rouge, LA – Just less than twenty-four hours before all of America would cast their votes for the 45th Presidents of the United States, the members of the Outstanding Mature Girlz (O.M.G.) Club made their way to the polls. Candidate hopefuls gave brief speeches to their peers, in hopes of becoming the next leaders of the all-girls club during the 2016 -2017 school year. “I love that I can run for President, it reassures me that I can do anything,” said Shy’Janae Hookfin who stunned her peers with a unanimous vote. Students also elected Chriterra Brumfield - Vice President, Ariel Scott - Secretary, J’Qualene Floyd - Treasurer, Shermil Myles - Parliamentarian, Symone Bryer - iReporter, and Khristian Muse - Chairman. The O.M.G. 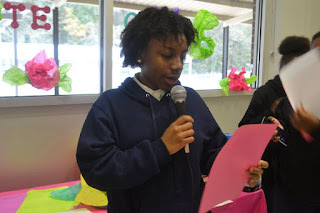 Club is an in-school and out-of-school club designed to create fun, informative public awareness platforms for girls in and around the state of Louisiana, to help service and educate them in the areas of HIV/AIDS and all other STD, and health related fields. This club also includes fun project based activities that will help girls learn new skillsets, all while promoting a healthy body, mind and spirit! Baton Rouge, LA – After several reports that the August 2016 flood waters contained chemicals and both human and animal feces, many gardeners and farmers in Baton Rouge and the surrounding areas were wondering about the health of their soil. 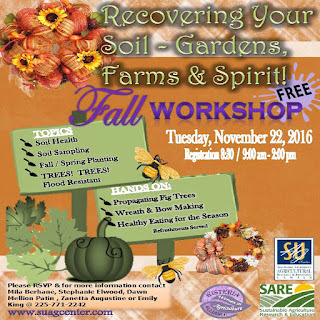 With that fact in mind, the Southern University Ag Center themed its' 2016 Fall Gardening Workshop, “Recovering Your Soil – Gardens, Farms and Spirit!” The workshop, which was held on Nov. 22 in A. O. Williams Hall - SU Ag Center - drew a crowd of more than 80 small and backyard gardeners, farmers and school and community garden coordinators. Southern University Ag Center Chancellor – Dean of the College of Agriculture, Dr. Bobby R. Phills welcomed the attendees to the Land-Grant Campus – made up of the SU Ag Center and the College of Agriculture. “When people think about the SU Ag Center, they only think about this building. But the SU Ag Center is also the agents housed around the state,” explained Phills. Southern University Ag Center Vice Chancellor for Extension, Dr. Dawn Mellion-Patin also addressed the attendees and explained why the SU Ag Center holds the Fall Gardening Workshop on the week of Thanksgiving every year. “We started this workshop four years ago and it is held at this time any year because we wanted to give the teachers an opportunity to come and take information back to their schools,” said Patin. Other presentations included a hands-on demonstration on Healthy Soils by USDA Natural Resources Conversation Services State Soil Scientist, Michael Lindsey, which discussed the importance of having cover crops to reduce soil run-off; Collecting Soil Samples Correctly, which explained the proper way to collect a soil sample and where the sample should be taken to be tested; Flood Resistant Trees for Louisiana’s Climate, which provided examples of the various water resistant trees that grow in the state as well as ways to plant trees in a manner that will allow them to serve as a barrier against flooding; Is Produce Safety Important?, which explained the importance of following safety rules and regulations when growing and harvesting produce and Growing with the Seasons, which discussed the types of fruits and vegetables that can be grown in each season. Attendees were also able to participate in either a hands-on fig propagation or wreath and bow making demonstration. 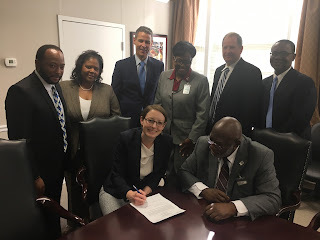 At the MOU signing between the SU Ag Center - College of Ag and the USDA's Agricultural Marketing Service are, seated from left, Elanor Starmer, USDA Agricultural Marketing Service (AMS) Administrator and SU Ag Center Chancellor - Dean of the College of Agriculture Dr. Bobby R. Phills; and standing, Arthur Neal, SU Grad and USDA Deputy Administrator for Transportation and Marketing Programs; Allison Johnson, USDA Liaison Officer; Ken Keck, Director of the USDA's Local Food Research and Development Divison; Dr. Dawn Mellion-Patin, SU Ag Center Vice Chancellor for Extension and Outreach; Bruce Summers, USDA Associate Deputy Administrator for AMS Fruit and Vegetable Program and Richard Lucas, USDA Deputy Associate Administrator for the Office of Policy Support. Photo by Dr. C. Reuben Walker, Associate Vice Chancellor for Research and Chairman of the Department of Agricultural Sciences. Baton Rouge, LA – Southern University Ag Center Chancellor - Dean of the College of Agriculture Dr. Bobby R. Phills, signed a memorandum of understanding (MOU) with the United States Department of Agriculture’s (USDA) Agricultural Marketing Service (AMS) on November 2, 2016 during a visit to the USDA’s Washington D.C. headquarters. As a part of the MOU, AMS will provide $50,000 to support the Beginning Agricultural Youth Opportunity Unit (BAYOU) Program at Southern University. The BAYOU program provides an array of recruitment and retention activities for high school seniors and incoming college freshman by providing them with first-hand knowledge about career opportunities in Agriculture, Family and Consumer Sciences, Business or the natural sciences. The MOU will strengthen the SU Ag Center – College of Agriculture’s partnership with the USDA’s Agricultural Marketing Service. St. Landry Parish Ag/ Garden Education Program on the MOVE! Students at Washington Elementary participated in the Southwest Center for Rural Inititatives "Youth Grow" gardening program. “Youth Grow” is a children’s gardening program aimed at developing sustainable garden education programs that connect youth to nature, educates them on the benefits of consuming fresh-grown food, and provides interdisciplinary learning opportunities. The program creates a pathway for increasing and introducing agriculture engagement within the school community. Through the use of lesson plans; students will learn Social Studies, Math, English and Language Arts, Physical Science, Life Science, and Earth Science. 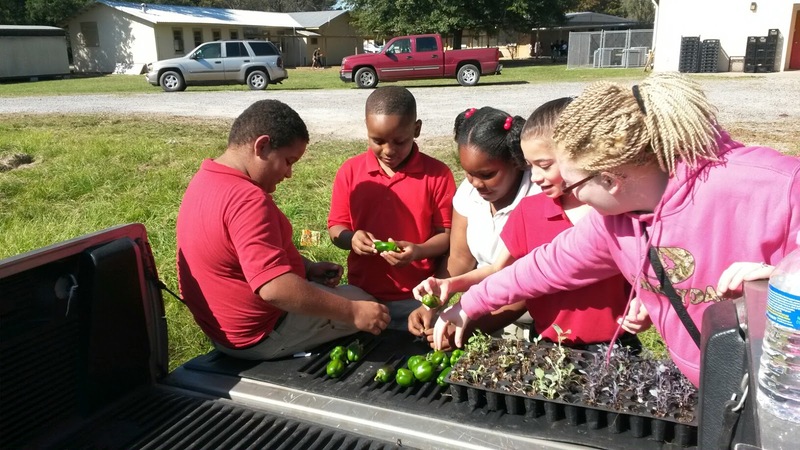 The Youth Grow program has been approved at all St. Landry Parish Elementary Schools. 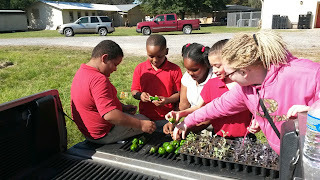 St. Landry Parish serves as a pilot to the full potential of the program, which aims at having raised bed gardens at each elementary school within the ten parishes served by the Southwest Center. “These gardens give us the opportunities to not only introduce youth to agriculture and gardening at an early age, but also Southern University,” said Chasity Johnson, youth agent in St. Landry Parish. Students and teachers at Washington Elementary planted cabbage, broccoli, and cauliflower in their four new raised-bed gardens supplied and installed by the Southwest Center/ Southern University Ag Center. 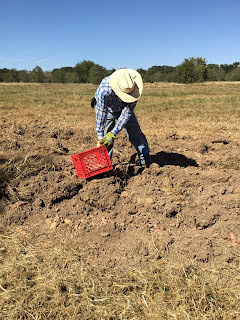 Southwest Center for Rural Initiatives volunteer Jessie Clark harvesting sweet potatoes at the North City Park Community Garden in Opelousas, La. Baton Rouge, LA – The Southwest Center for Rural Initiatives (SCRI) currently maintains several community gardens throughout St. Landry Parish. Throughout the year, the garden and land is cared for by Jessie Clark. Recently, Jessie and the Southwest Center staff harvested sweet potatoes from the North City Park Community Garden in Opelousas, La. The garden is located within a low-income housing area, and was constructed through a partnership with the Opelousas Housing Authority. The sweet potatoes harvested were given to residents to ensure they would have fresh produce. “We see the blue van working out here all the time, and really feel blessed when they provide us with what they grow,” said a resident. Southwest Center for Rural Initiatives Director Antonio Harris, sitting on left, and Extension Agent Krystle Washington, sitting on far left, share information about careers in agriculture. Baton Rouge, LA – The Southwest Center for Rural Initiatives staff participated in the 19th Annual Career Futures Expo on October 26, 2016 at Northwest High School in St. Landry Parish. Every 10th grade student (roughly 1,200 students) from St. Landry and Evangeline Parishes traveled to explore the different career paths displayed during the expo. 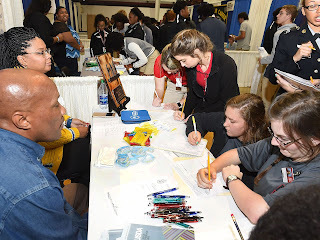 The event, which was hosted by the St. Landry and Evangeline Parish Chambers of Commerce, St. Landry & Evangeline Career & Technical Education Programs and the St. Landry & Evangeline Parish School Boards, was designed to help 10th grade students identify and explore career interests that provide them with the opportunity to interact with professionals looking to the future and exploring their options. “I was very amazed and impressed by the students’ knowledge and interest in our field,” said Kayla Fontenot, youth agent. The staff of the Southwest Center also took the opportunity to speak with the students, and promote the BAYOU program and ultimately attending Southern University’s College of Agriculture post-graduation. “Recruitment starts early, so if we can introduce them to the College of Agriculture in 10th grade; we are planting the seed for them to become future Jaguars and ultimately leaders in Ag,” said Krystle Washington, Extension Agent in St. Landry Parish. To read more about the event and see additional pictures, visit the Daily World. 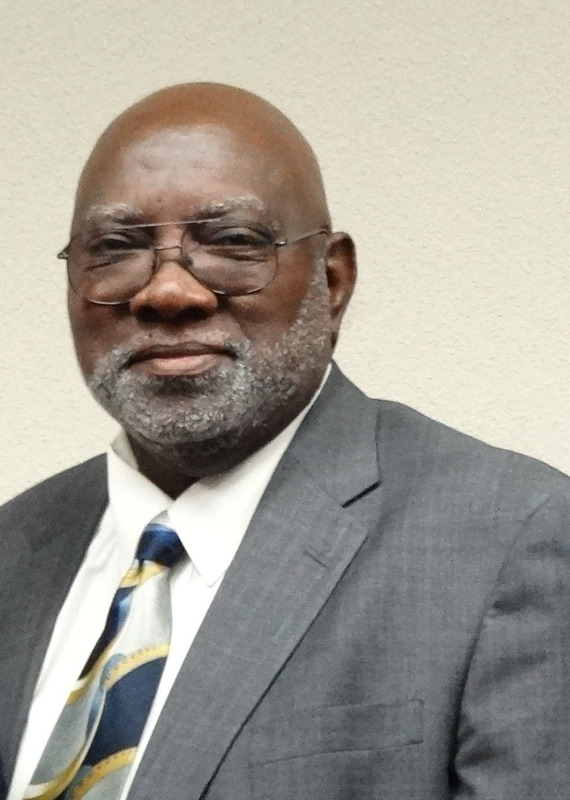 Baton Rouge, LA – Southern University Ag Center Chancellor – Dean of the College of Agriculture Dr. Bobby R. Phills will discuss the future of the Southern University System’s Land-Grant mission during the campus’ first seminar series of the 2016-2017 academic year. The seminar titled, “Enhancing Southern University Academic\Research and Outreach Programs via Land-Grant Function,” will be held at 3 p.m. on Nov. 17 in room 191 of A. O. Williams Hall – SU Ag Center Building. The seminar committee is planning to hold a seminar each month throughout 2017. 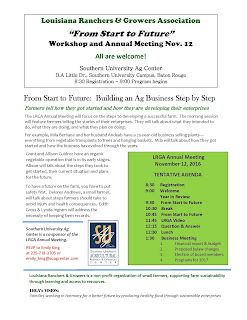 These seminars will provide SU Ag Center and College of Ag faculty, staff, students and the Baton Rouge community with information on food and agriculture, academic and research updates that impact the food and agriculture communities and citizens of Louisiana, outreach programs and topics related to higher education. The seminar can be viewed via the web at: https://www.youtube.com/watch?v=d-oN0frSE98. 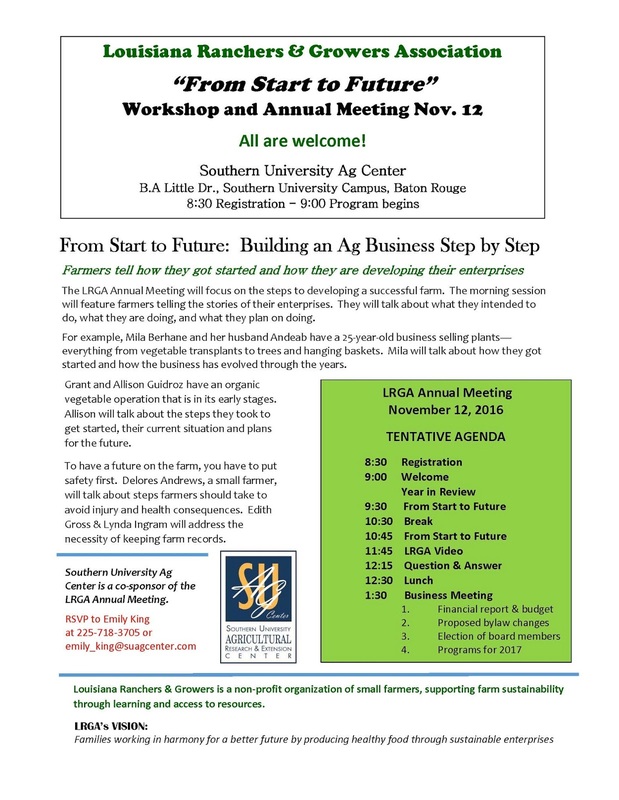 For additional information contact the SU Ag Center at, 225-771-2242. 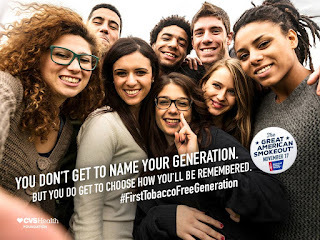 Baton Rouge, LA – The American Cancer Society has dubbed the third Thursday of every November as ‘The Great American Smokeout.’ Smokers are encouraged to use the date, which is November 17 this year, to make a plan to quit, or to plan in advance and quit smoking on that day. Southern University students, faculty, staff and the Baton Rouge community are invited to attend the CoC’s Great American Smokeout event from 11 a.m. – 2 p.m. at Fisher Hall on the Southern University Baton Rouge campus. The event will feature a seminar that will address the benefits of quitting smoking for the day with the hopes of quitting for good and a booth display that will provide attendees with an opportunity to enroll in smoking cessation programs. The Southern University Intramural Sports Department will also be on hand to get participants to substitute the butts and move to the beat of healthy living. A “smoke out” of refreshments will be served off the grill to include: hamburgers, sausages, and hot dogs. Participants will also receive collaterals with no smoking messages. The CoC will also host a cessation presentation at the Bethesda Rehab Outpatient, 7222 Bluebonnet. The event, which will be held from 1 p.m. – 2 p.m., will also provide individuals with cessation resources to help them stop smoking and a demonstration on the harmful impact of tobacco on the body. For additional information on these events, contact Linda Brown or Frankie Poland at 225-771-2242. During this event, which will be held from 11 a.m. – 2 p.m. on the Southern University New Orleans (SUNO) campus - 6400 Press Drive, people who visit the informational site will receive vital information that can save a life. They will exchange their cigarettes for “cold turkey” sandwiches to quit for the day. The CoC’s staff and volunteers will also provide smoking cessation incentives, as well as, information about heart and vascular health. A booth display will be available to ensure individuals receive resources for cessation and information regarding the dangers of tobacco. For additional information, contact Hendrix Broussard at 504-736-6519. Southern University at Shreveport (SUSLA) students, faculty and staff are invited to participate in an evening of smoke-free fun. The CoC will host if Shreveport Great American Smokeout event from 4 p.m. – 6 p.m. at the Shreveport Job Corps, 2815 Lillian Street. The event will feature a Bingo style game called, “What’s in Tobacco,” and a Cessation Workshop. Participants will also have an opportunity to visit a Secondhand Smoke Display and enroll in the smoking cessation trust. For additional information, contact Urina Holt at, 318-670-9633. “As an agent of change, Southern University Ag Center’s Communities of Color Network is ecstatic at the opportunity to mobilize our team and utilize our resources, to save lives through educational awareness activities that will permanently make a difference in the lives of our constituents statewide, especially as we celebrate Great American Smokeout Day,” Linda Early Brown, Director of the Communities of Color Network. About 40 million Americans still smoke cigarettes, and tobacco use remains the single largest preventable cause of disease and premature death in the world. While cigarette smoking rates have dropped (from 42% in 1965 to 17% in 2014), cigar, pipe, and hookah – as well as other dangerous and addictive ways to smoke tobacco – are very much on the rise. Smoking kills people – there’s no “safe” way to smoke tobacco. Quitting smoking has immediate and long-term benefits at any age. Quitting is hard, but individuals can increase their chances of success with help. Getting help through counseling or medications can double or triple the chances of quitting successfully. By quitting – even for 1 day – smokers will be taking an important step toward a healthier life and reducing their cancer risk. CoC is an affiliate of the Louisiana Public Health Institute/The Louisiana Campaign for Tobacco-Free Living. The network provides support and technical assistance to African-American communities to ensure that they are well-informed about the dangers of tobacco, and understand how to protect themselves from unhealthy exposure. Its mission is to eliminate health inequalities caused by or related to tobacco use among Louisiana communities of color by building coalitions, increasing awareness of the dangers of tobacco, and reducing tobacco consumption and secondhand smoke exposure. For additional information about the Communities of Color Network, contact Linda Early Brown at 225.771.2242. 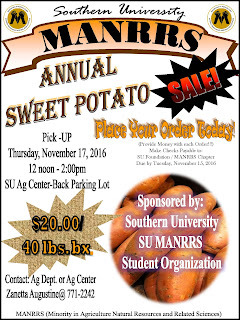 Baton Rouge, LA – The Southern University chapter of the Minority in Agriculture Natural Resources and Related Sciences (MANNRS) - a student organization - is currently taking orders for its Annual Sweet Potato Sale. 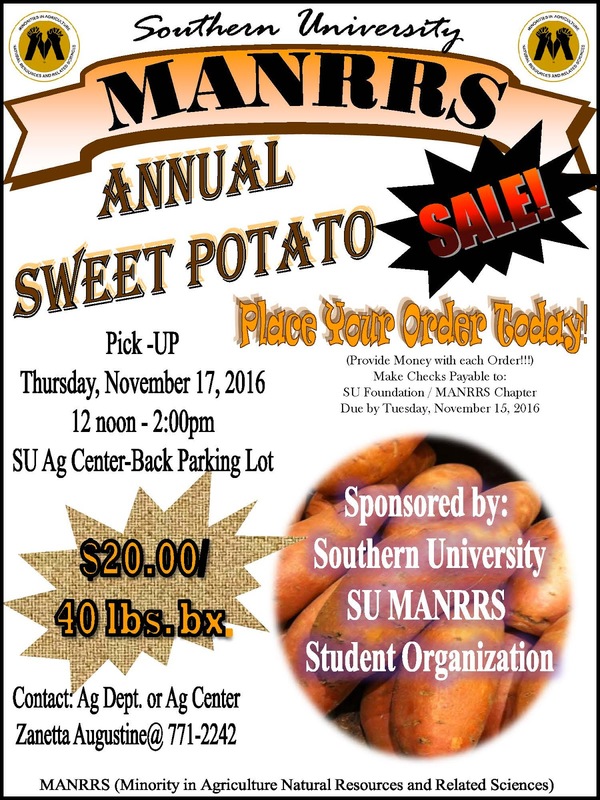 Individuals can purchase 40 pound boxes of sweet potatoes for $20. Payment is required with your order in the form of cash, checks and money orders. Checks and money orders should be made payable to the SU MANNRS Chapter. The deadlines to place an order is Tuesday, November 15. Pick-ups will occur Thursday, November 17 from noon to 2 p.m. at the SU Ag Center – A.O. Williams Hall back parking lot. For additional information contact, Mrs. Zanetta Augustine at 225-771-2242. 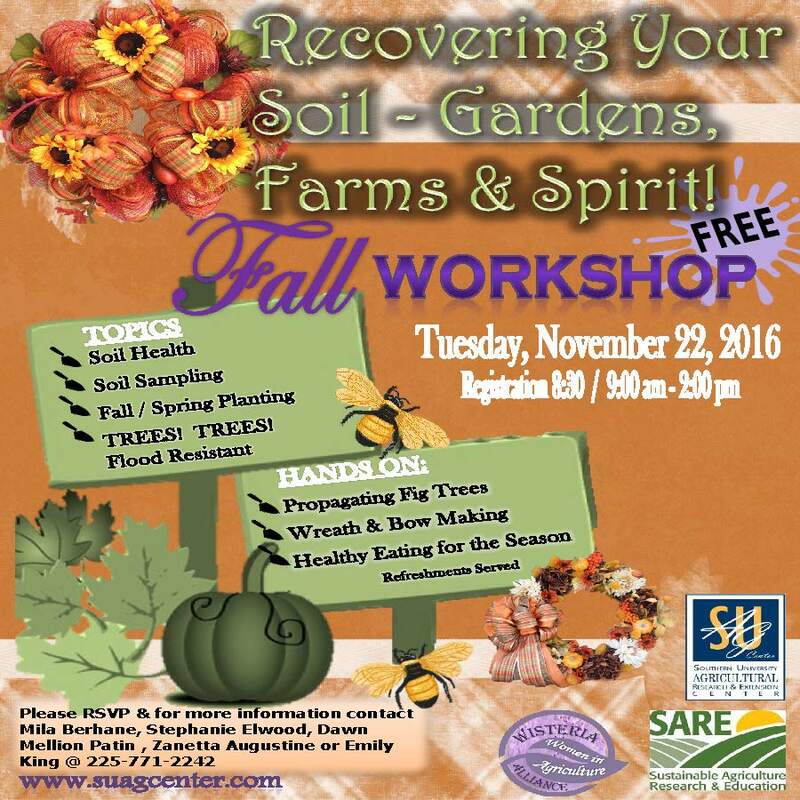 Baton Rouge, LA – The Southern University Ag Center will host its Fall Garden Workshop themed, “Recovering Your Soil – Gardens, Farms and Spirit.” The workshop, which is free and open to the public, will be held from 9 a.m. – 2 p.m. on Tuesday, November 22, 2016. This workshop is ideal for school and community garden coordinators, large and small farmers, backyard gardeners, college students and anyone interested in learning something new about agriculture. The Southern University Ag Center, its Wisteria Alliance Program and the Sustainable Agriculture Research and Education (SARE) Program are co-sponsoring this event. For additional information or to RSVP, contact Mila Berhane, Stephanie Elwood, Dr. Dawn Mellion-Patin, Zanetta Augustine or Emily King at 225-771-2242. Mrs. Mila Berhane, SU Ag Center Senior Research Associate, will serve as one of the speakers at the event which will take place at the Southern University Ag Center on 181 B.A. Little Dr., Baton Rouge, LA 70813, with registration beginning at 8:30 a.m. Farmers will share how they got started and how they are developing their enterprises. The morning session will feature farmers telling the stories of their enterprises. They will talk about what they intended to do, what they are doing, and what they plan on doing. For example, Berhane and her husband Andeab have a 25-year-old business selling plants—everything from vegetable transplants to trees and hanging baskets. Mila will talk about how they got started and how the business has evolved through the years. Grant and Allison Guidroz have an organic vegetable operation that is in its early stages. Allison will talk about the steps they took to get started, their current situation and plans for the future. To have a future on the farm, you have to put safety first. Delores Andrews, a small farmer, will talk about steps farmers should take to avoid injury and health consequences. Edith Gross & Lynda Ingram will address the necessity of keeping farm records. The LRGA’s annual meeting will begin at 1:30 p.m. and will consist of a business meeting focusing on the organization’s financial report and budget; proposed by-law changes; election of board members; and programs for 2017. The event is free and open to the public. Please RSVP by calling Emily King at 225-718-3705 or via email at emily_king@suagcenter.com. Baton Rouge, LA – The Southern University Ag Center is participating in a $3.625 million grant to assist produce growers in improving their safety practices ahead of the U.S. Food and Drug Administration’s (FDA) implementation of its Produce Safety Rule. The grant was awarded to the Louisiana Department of Agriculture and Forestry by the FDA. The Southern University and LSU Ag Centers are collaborators on the grant with the SU Ag Center receiving about $500,536. Earlier this year, the FDA awarded a total of $21.8 million in grants to agencies in 42 states to help implement the Food Safety Modernization Act (FSMA). “The funds will help educate farmers, especially small and underserved produce growers, about the Produce Safety Rule that is part of the Food Safety Modernization Act,” said Fatemeh Malekian, SU Ag Center Professor of food science and nutrition and Project Director of the grant. “The SU Ag Center will bring experience and collaborate with other entities in conducting farm inventory (especially for small farmers), conducting a self-assessment/readiness, evaluating existing statutory and/or regulatory authority related to produce safety, conducting trainings and determining the changes to establish, operate and maintain a Produce Safety Program that is supportive of the requirements in the FDA's Produce Safety Regulation,” she continued. The SU Ag Center will also hire a Produce Safety Program Coordinator to oversee the progress of the project. The Produce Safety Rule was finalized in November 2015 and sets standards for growing, harvesting, packing and storing fruits and vegetables. It addresses water quality, composting, farm personnel health and hygiene and equipment sanitation among other issues. Large farms must comply with the rule by January 2018. Smaller farms have more time to comply. Malekian stated that both Ag Centers will work together to create an inventory of Louisiana farms, especially small farms, subject to the Produce Safety Rule and related state regulations. The Ag Centers will also jointly educate growers on safety practices and rules through several workshops that are being planned for early 2017. These workshops will explain how the new regulations will affect farms and what steps growers must take to get in compliance. Malekian and several LSU AgCenter agents will travel to Overton, Texas, from Nov. 7 - 8, to take a train-the-trainer course taught by experts from Texas A & M University, the Produce Safety Alliance and the LSU AgCenter. “This will provide me with the background and information I need to teach and set food safety workshops utilizing the FDA produce safety standards,” added Malekian.